If you have not registered to vote you have a week to get it done. You can do this at City Hall, the courthouse or online. This year is critical for Florida and the two platforms have never been more polarized than now. Even nationally many are watching Florida as a microcosm of the nation. This year we have 12 amendments to vote on. These range from allowing felons to vote, offshore drilling, casino gambling, victim rights, dog racing and property taxes among others. All these will affect life in Florida, and you need to voice your opinion by voting. Please take the time to register and vote. I think in the last election about half of our residents actually got out and voted. Landscapers here in Naples will soon have to contend with a new parking law that is going into effect in some parts of the city. Now these lawn trucks and trailers will not be allowed to park in the street, set out a couple cones and block traffic on one lane. The areas that are implementing this will require lawn and other worker trucks park in driveways or on your lawn but will not be allowed to block the road. This is an issue that could come up here in Royal Harbor so be thinking about it. Another issue is noise, I reported last year that some areas are no longer allowing gas-powered lawn tools. They are requiring electric ones that are many times quieter. Some experiments were done on this over the summer, and it will be interesting to see how these worked out. We have a new city manager. Charles Chapman. He was offered the job after the first candidate turned the offer down saying housing costs were too high for her. (did she not look at this before she went through the 6-month process of applying and interviewing for the job?) Just saying. I have not met him yet. I keep seeing the commercials for the 1% increase in sales tax. Remember, if you think we are taxed enough, this is your chance to vote NO. One advertisement has a lady saying, “well its only a penny” do not be fooled it’s a penny on every dollar you spend. That adds up to quite a bit. The ad says something like $150 per household, but that is the tax on $15,000. Think you can live on spending $15,000 a year? Do you think that if passed this will actually end in 7 years? You know that at that time the government will tell you we need the money and it will cost you no more than you are paying now. They always find a way to keep taxes coming in. Someone reported they had White Fly in their palm trees Royal Harbor… I hope not but you better check yours to see. 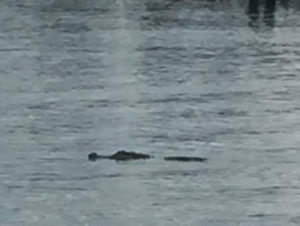 Also, I saw a big alligator last week in Naples Bay in the river by Naples resort and Naples Sailing and Yacht club. Look before you jump in. The board is working on the Halloween venue for this year. More to come.